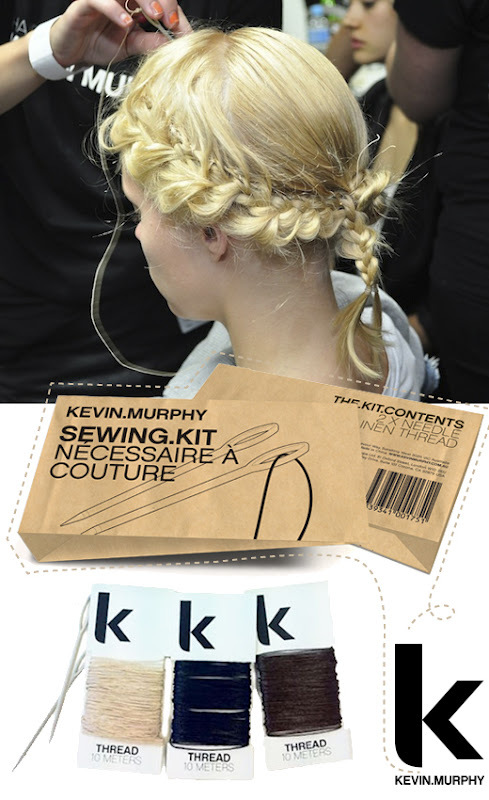 I was asked to model for my friend's salon SACO Mtl during their Kevin Murphy's presentation last week. Although I've always been obsessed with BIG CURLS (don't we all want what we can't have?!? ), according to Master Stylist and Right Hand of Kevin Murphy, Mr Tim McClean mentioned that the modern hair is big and full of volume. In other words, we should all throw away our straightening iron! The other two key words he kept repeating are "professionally undone". Wildness with control. Let our hair air dry but with the right products. At their studio, he offers clients workshops where he teaches quick ways to add volume/curls without heat...all while you can put your makeup on! And most important advice, to keep the curls modern, start between the temple and cheekbone instead of at roots to avoid a recreation of the 80's. One tool used on me that I thought was the most innovative was the Sewing Kit, which is basically a set of two giant needle and linen thread to match your hair colour. After curling my hair, he used it to secure a messy up-do (sorry I forgot to take pictures of that) by "sewing" my hair together! It was painless (no bobby pins digging into my head thank you) and such a seamless look! 2001 University, suite 350, Montreal, QC.